WASHINGTON (April 21, 2015) -- For 30 years now, the Army has embedded scientists and technology experts in the field - to ensure the exchange of new technology and the feedback it yields - moves efficiently between the researchers who develop it and the Soldiers who use it. Since the summer of 1985, Army science and technology advisors, part of the U.S. Army Research, Development and Engineering Command, or RDECOM, have provided for their assigned commands easy access to the technologies and bright minds that are available within Army research, development and engineering centers. 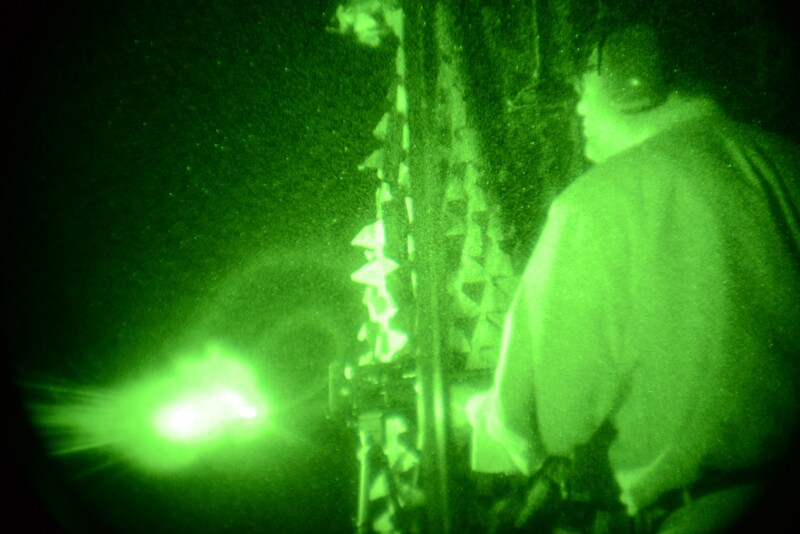 Chirag Y. Trivedi, a science and technology advisor with the U.S. Army Research, Development and Engineering Command, fires a rifle, in the dark, at the Night Vision and Electronic Sensors Directorate range on Fort Belvoir, Virginia, April 17, 2015. As a result, problems that can be solved with technology can be solved more quickly, and commanders can instead concentrate on their mission. "They are senior engineers and scientists that RDECOM embeds ... to provide reach-back to the Army enterprise, in terms of research and development," said James Gibson, director of the Field Assistance in Science and Technology Directorate at RDECOM, of the command's science and technology, or S&T, advisors. "If the combatant command has an operational issue that they think might have a technological solution, then the science advisor would engage on that." Gibson said that the Army has always provided similar reach-back for fielded programs or programs of record. But the S&T advisor program increased that capability. "What was absent was a reach-back to the science and technology community," Gibson said. "Our senior commanders recognized that and asked Army Materiel Command what they could do to position people forward to assist on those issues." When it stood up, the S&T advisor program initially covered just South Korea and Germany, Gibson said. Today the program has expanded to provide advisors to the senior staff at combat training centers, major commands, combatant commands, and corps commands. In 2003, RDECOM even started provided specialized teams of S&T advisors to the Iraq and Afghanistan theaters. The advisors, mostly senior scientists, physicists, computer scientists and engineers, are already RDECOM employees. As part of the S&T advisor program, they are assigned for two-to-three year advisor roles. Gibson said the Army now has about 25 S&T advisors deployed worldwide, half officer and half senior Army civilian. While S&T advisors are already experts in some scientific field, they must be prepared to provide to commanders input and advice on the wide array of areas of research and capability offered by RDECOM. To prepare the advisors for their role, RDECOM puts them through a three-week orientation and reach-back training program, ORBT. Two iterations of the course happen each year. "Each one of them comes to us with some level of specialty in their background," Gibson said. "What we are trying to do over this three-week program is broaden their horizons so they become exposed to the total enterprise of RDECOM. Part of this training is to position them to be somewhat conversant in other fields they may not be familiar with." The five new S&T advisors undergoing the most recent iteration of ORBT spent the last day of their first week of training, April 17, at the Night Vision and Electronic Sensors Directorate, or NVESD, on Fort Belvoir, Virginia. There, students were exposed to the variety of night-vision equipment technology within the RDECOM domain. By the end of the ORBT, the five new S&T advisors will have visited and learned about RDECOM capabilities in Huntsville, Alabama; Natick, Massachusetts; Rockaway, New Jersey; and Aberdeen Proving Ground, Maryland. After spending time learning about night vision goggles at the NVESD facility on Fort Belvoir, Lt. Col. Marc Meeker, a science and technology advisor assigned in South Korea for two months now already, explained how in his new role he serves as a kind of translator between the engineers and researchers of RDECOM and the Soldiers in the command he advises - U.S. Forces Korea. 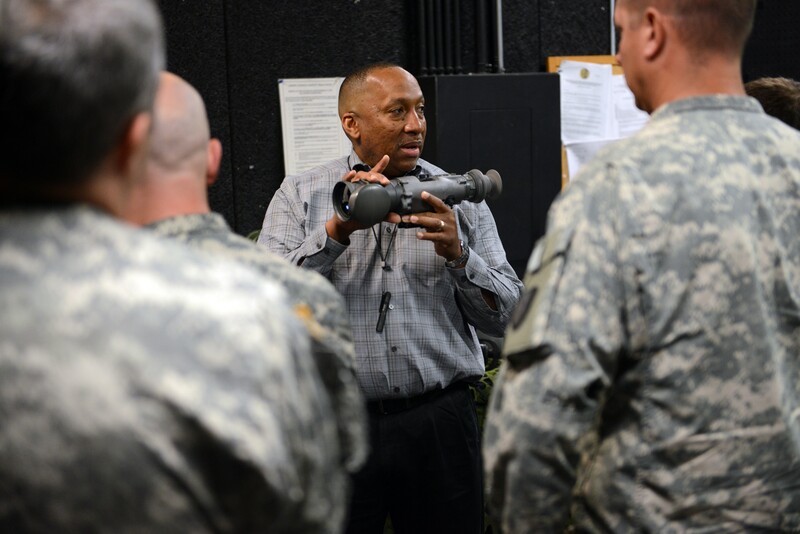 Clifford A. Surrett Sr., an engineering technician with the Night Vision and Electronic Sensors Directorate on Fort Belvoir, Virginia, discusses night-vision devices with students in the most recent orientation and reach-back training iteration, April 17, 2015. "I'm somebody who speaks the language of engineers and who speaks the language of Soldiers and helps to get needs and requirements from the Soldier back to the engineers," Meeker said. "I can also help to get neat ideas and solutions to these problems back down to the Soldier as fast as possible. A lot of times the Soldiers and engineers don't necessarily speak the same language." Meeker said that while conflict has now drawn down in Iraq and Afghanistan, there still hasn't been a formal peace declared between South Korea and North Korea. Because of the standing conflict, Soldiers stationed there must always be ready - and that means having the best technology available. Meeker said as an S&T advisor he provides a link between those Soldiers, the technology they need, and the technology they haven't even thought about yet. "There is always a need for technology in [Korea]," Meeker said. "Bringing the new technology out there, even prototypes to have them tested, is what I intend to do. I am very much looking forward to getting some of this technology into the hands of Soldiers and working though this ORBT program to learn about the portfolio of products that the RDECs have under RDECOM." Meeker said mastering the array of RDECOM capability is important "so when Soldiers tell you they have a certain problem set, you know what is available out there or you know who to reach back to in order to get information about what the latest and greatest is." With a background in mechanical engineering, and having served as both an Army ordnance officer and within the acquisition community, Meeker said that his Army career has led him to his role as an S&T advisor. "From the ordnance arena, I was on the receiving end of a lot of the neat technologies that got pushed out to the field," he said. "Then when I worked [for] the program manager for crew-served weapons as the sniper assistant program manager, I got to help push a lot of those systems out and help with the fielding of the M110 sniper rifle - the same in program manager-maneuver ammunition's systems, when I was working in medium caliber. Now, of course, I am looking at the newest technologies that we are doing research and development on. I am trying to get prototypes out into the field. They get moved to the program management offices for development if the technology is good." Andrew M. Margules, a science and technology advisor, assigned to Joint Base Elmendorf-Richardson, Alaska, is participating in the ORBT alongside Meeker. Margules has been an S&T advisor in Alaska for six months now already. Margules said a goal of his tenure, as an S&T advisor to U.S. Army Alaska, or USARAK, is to increase the collaboration between the command and the Army's research and development community. He said there are advantages to working with Soldiers stationed in Alaska. "I think a lot of times [the RDECs] reach out to CONUS units because they are easier or closer," he said. "But I think USARAK and other U.S. Pacific Command units have unique opportunities to evaluate equipment in non-traditional environments - though relative environments and real environments. It's not a simulated experiment, where we are going to bring something into a cold chamber and test it out. We can actually bring it to the Arctic and test it outside and get that good data for you." Margules said he likes working in RDECOM labs, but that being out in the field among Soldiers has been a new experience for him that he has enjoyed. "I actually go out in the field with these guys ... and actually participate with them in what I can," Margules said. "In February we were doing some exercises through the FAST office - we were bringing up some kit to test out. We were walking through the woods with the Soldiers. We were in the squad, with them, walking. And every time they had a complaint - they'd ask 'where's the science guy?' And I was running up in my snow shoes right behind the guys asking what's going on. 'Show me the actual problem you're having right now,' I'd say. That they know I'm there - it's important to me. And it's important that they know I take their concern back with me." As an S&T advisor for RDECOM stationed in Alaska, Margules expects to work with not just senior leaders but with those junior Soldiers as well. And in fulfillment of his role as an ambassador for RDECOM to units around the world, he hopes to make their operations easier by ensuring the equipment and technology they use is the best possible. He said he does that best standing shoulder-to-shoulder with the Soldiers. "Show me how you are actually using this equipment," he said. "Maybe I'll see something that isn't working right that you didn't pick up on. And you'll maybe see something not working right that I didn't know about. And together we'll take those two pieces and make it even better, through RDECOM."